Mr E is an SSB4 Lucina main from New York, and is considered the best Lucina player in the world and the second best Marth player in the world (behind MkLeo) before solo maining Lucina. 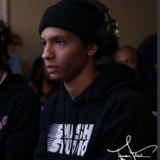 Mr E is currently ranked 3rd on the New York Smash 4 Power Rankings and 37th on the Panda Global Rankings 100, and was formerly ranked at the 7.5 position on the SoCal Smash 4 Power Rankings. He has taken sets off of top players such as ZeRo, Salem, Nairo, Tweek, Dabuz, Larry Lurr, tamim, Ally, CaptainZack, Shuton, and Marss. Mr E is known for his proficient usage of footstooling, such as double-footstooling his opponent offstage. This has become known as the "Mr E Classic". On January 24, 2017, Mr E announced his free agency, parting ways with Smash Studios. On February 16, 2017, Mr E was signed by Team RivaL. On September 4th, 2017, Mr E and Team RivaL would part ways. Later that same day, Mr E was signed by FStep. On December 8th, 2017, Mr E and FStep parted ways, thus rendering Mr E a free agent once again. ↑ Team RivaL signs Smash 4 Marth player Mr.E. This page was last edited on April 21, 2019, at 16:20.